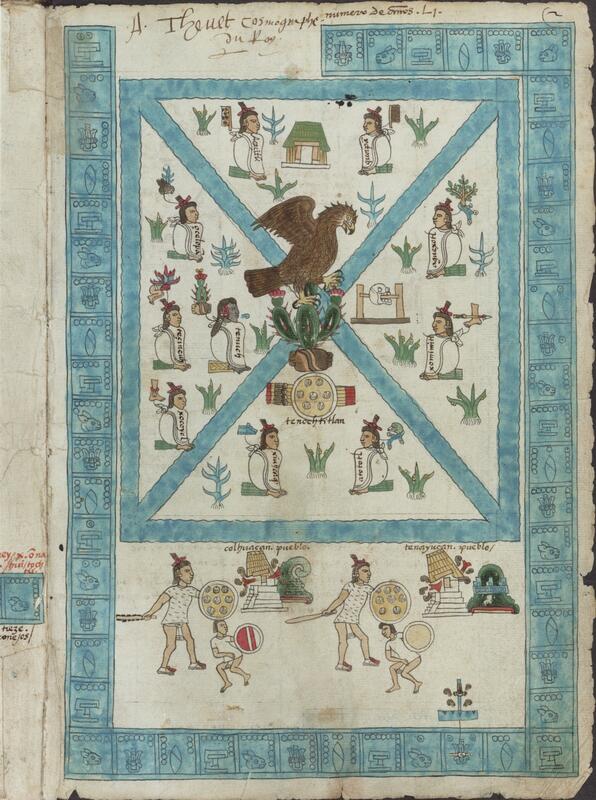 This painted manuscript page depicts the foundation of the Aztec capital city, Tenochtitlan. The painting is the first, and one of the most elaborate, images in the Codex Mendoza. The Codex was created by indigenous painters in the mid-16th century, probably at the behest of the first Viceroy of New Spain, Antonio de Mendoza. It recalls and documents imperial tribute lists, royal history, and practices of daily life among the pre-Hispanic Aztec. Tenochtitlan was an island city and the blue rectangle that dominates the page represents the lake waters separating the city from the mainland. The blue diagonals that cross throughthe center of the image suggest the canals that cut through the capital city. At the center of this schematic map, an eagle appears. It is perched on a cactus to evoke an Aztec origin narrative. One of the gods, Huitzilopochtli, prophesied that a capital should be founded at the site where an eagle alighted upon a prickly pear cactus. The cactus, in turn, grows out of stone, below which is set a round shield and red-tipped arrows. The shield and arrows refer to the military ambitions and strength of the empire. Two cities, Culhuacan (spelled Colhuacan in the gloss) and Tenayucan, appear at the bottom of the page as they are defeated by the Aztec. The burning temples upon hilltops are pre-Hispanic-signs for subjugation, and the victorious Aztec warriors hold round shields and clubs studded with obsidian. To the left of the central cactus, Tenoch appears. He was one of the ten founders of the city shown on this page. His name, like those of the other founding fathers, appears in both alphabetic lettering upon his cloak and in glyphic form, as a small prickly pear cactus (“tenochtli” in Nahuatl) behind his head. Around the page, the artist has set a blue frame of dates, each set in a small rectangle. They show the first 51 years of Tenoch’s rule, the first 51 years of the Aztec empire. At the bottom right of the page, a small fire drill is set above the year 2 Reed (1351 of the Common Era) refers to the Aztec New Fire Ceremony, an event that transpired every 52 years. During the ceremony, all fires, be they for sacred offerings or daily cooking were extinguished. Using a fire drill, a priest rekindled a flame that was sent out first to Tenochtitlan and then across the empire for this ritual of new beginnings. At the top of the page appears the signature of André Thevet, a French royal cosmographer who owned the Codex in the 16th century, after it had been captured by pirates during its first transatlantic voyage and then presented to Henry II, the King of France. Scholars believe the first Viceroy of New Spain, Antonio de Mendoza, commissioned the codex and today it bears his name (Codex Mendoza). The painter of this foundation scene may have been Francisco Gualpuyogualcal, an indigenous man working with friars in Mexico City in the mid-16th century. Another native man, Juan González, who worked as a Nahuatl-Spanish interpreter at the Cathedral of Mexico City, may have added the glosses. The Codex Mendoza measures 32.7 x 22.9 cm, is bound on its spine like a European book, and is made of 72 pages of European paper with Spanish commentary. Yet the imagery, the work of indigenous painters, owes much to pre-Hispanic-style painting and themes. To create the Codex, the images were painted first by Nahuatl-speakers well trained in pre-conquest modes of representation. Spanish commentary was then added by other hands before the book left New Spain. But it fell into the hands of French pirates on its way across the Atlantic, and its French collector proudly signed his name: A[ntoine] Thevet, King’s cosmographer. The Codex Mendoza was originally sent, via Spanish flotilla, from Veracruz to Charles V, King of Spai. On this trans-Atlantic trip, French pirates seized it and other booty. The King of France, Henry II, thus became its first royal owner. Passing through diplomatic hands, the book was given to André Thevet, a French royal cosmographer, who had spent time in Brazil and had a strong interest in the Americas. Eventually the Codex made its way to Great Britain where, since 1659, it has resided in the Bodleian library at Oxford. The foundation of Tenochtitlan was an event that no 16th-century Aztec had witnessed. This scene thus depicts a narrative well honed and filtered by generations of retelling. At the time of the painting’s creation, about 1542-1545, large swaths of the pre-Hispanic capital had been dismantled and, under Spanish direction, were being transformed into a viceregal capital. Yet none of that transformation appears in this scene, which instead focuses upon the ancient past. The Codex Mendoza is clearly a post-conquest document and while created for European viewers, the imagery confirms that calendrical, glyphic and other conventions of representation were still well remembered and transmitted by elite indigenous men, even as they were themselves were becoming Christians. The Codex represents one example of pre-Hispanic knowledge and mode of record keeping that entered into the court circles of Europe. Reproduced courtesy of the Bodleian Library, MS. Arch. Selden. A. 1. Bleichmar, Daniela. 2015. "History in Pictures: Translating the Codex Mendoza." Art History 38 (4): 682-701. Robertson, Donald. 1994 . 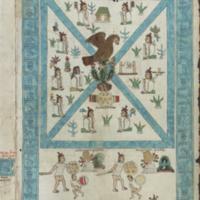 Mexican Manuscript Painting of the Early Colonial Period: The Metropolitan Schools. Intro. by E. H. Boone. Norman: University of Oklahoma. Berdan, Frances F. and Patricia R. Anawalt, eds. 1992. The Codex Mendoza. 4 vols. Berkeley and Los Angeles: University of California Press.